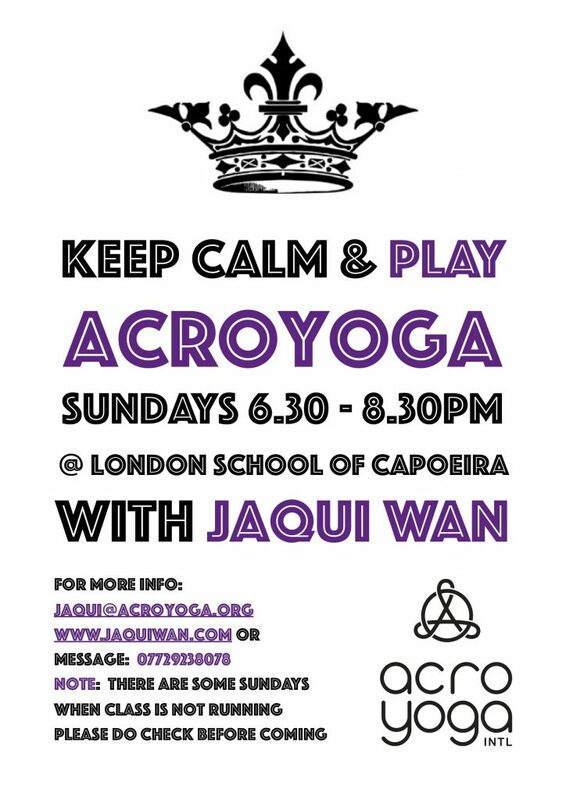 Asana Yoga, AcroYoga, Healing Arts and much much more,..
Costs: £16 drop in £13 concessions, six class pass for £80 value for three months. Explore the interplay of yoga, acrobatics and healing arts. The class can cover acrobatic principles, alignment techniques and strength elements to aid basic partner balancing and flying sequences. We will explore the abundant potential of physical collaboration, whilst in pairs or in small groups. Delve into the world of connection, trust and play. No partner or experience required. Challenge your yoga asana practice and explore the world of balancing on your hands. This workshop is ideal for those with regular yoga asana practice and or other forms of body awareness practices; and who are keen to discover their hands and arm balancing potential. You will learn the alignment techniques, strength elements, the embodiment of inversions and taking weight on your arms and hands. We will build it up progressively working on upper body stamina, core conditioning and wrist awareness. It’s your chance to challenge yourself and get creative in your asana practice. Ready to do anything. There is almost no such thing as ready. There is only now. 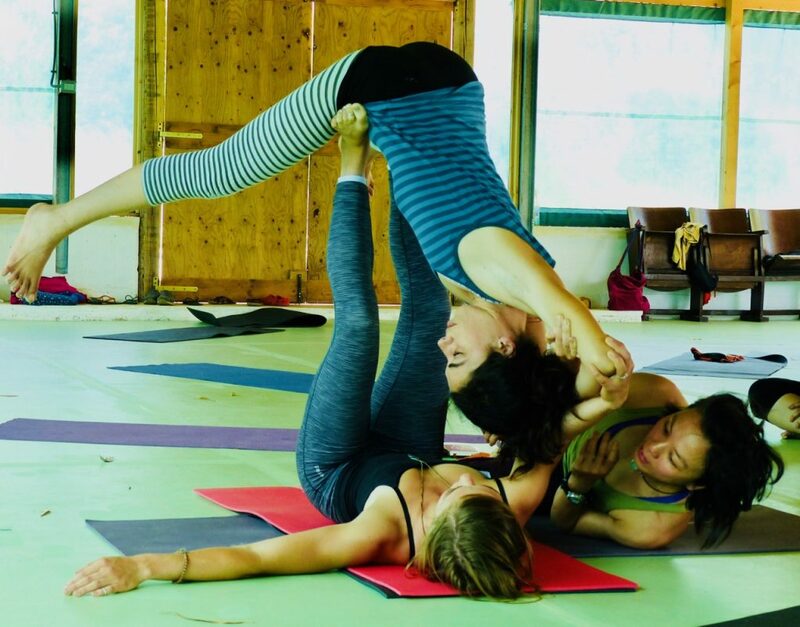 The Lunar side of AcroYoga allows us to slow down and cultivate the art of deep listening, conscious touch and the capacity of giving and receiving. 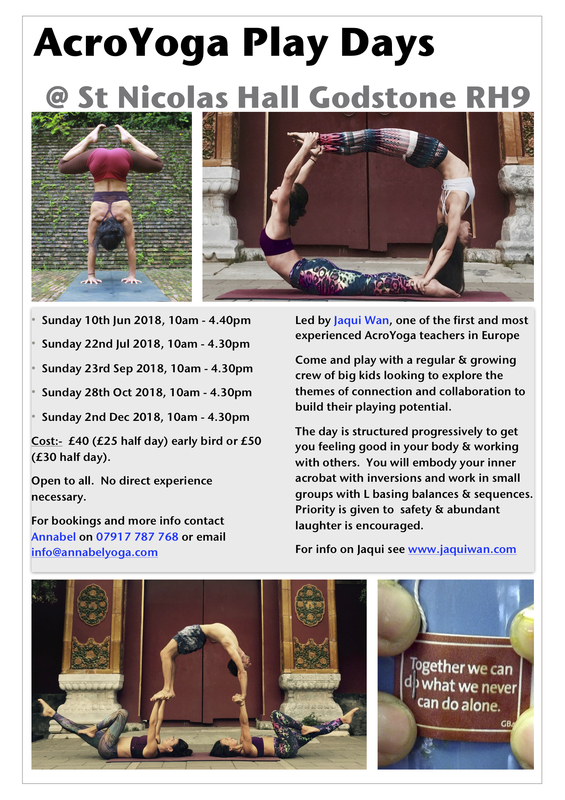 This workshop will introduce you to Thai massage techniques; the use of gravity, body weight, touch and harmonics to realign and release. We will cover the foundations to flying therapeutics involving a base and flyer; the base embodies a solid structure for the flyer to experience inverted aerial passive balances that are blended with therapeutic massage techniques. Open to all and especially those interested in massage or other forms of bodywork. You will be working in pairs or in small groups. Massage is not just a luxury its a way to a happier and healthier life. Counterbalances are when weight is used as a lever to reduce the effort of lifting loads, thereby enabling the balance of another weight. We will look at how this can be applied to individuals working together as a pair and what potential balances can be created. We will up look into the push-pull nuances of balance; the engagement and release that allows stability in both symmetrical and asymmetric structures and how to safely build interesting shapes and poses. Explore the wonders of human counterbalances, delve into your creative potential. A regular body awareness practice would be a good advantage. Come or your own or as a pair; we will get to mix and match with everyone in the room. If you want to go fast, go alone. If you want to go far go together (African Proverb). Cost: Early Bird £40 (£25 half day) for bookings made two weeks before the event or thereafter £50 (£30 half day). All bookings are made with Annabel Broom. Our ongoing play dates in Godstone are open to all. Come and share your day with a regular and growing crew of big kids who want to explore the themes of connection and collaboration with the purpose of building their playing potential. The day begins with a cup of tea and admiring the stock piles of chocolate that are likely to be consumed during the day. We get you comfortable in your physical body and at ease with working with others; it may range from partner stretches to full on acrobatics conditioning, to get your body warm and ready for the day ahead. Thai massage & flying therapeutics. There is a real supportive atmosphere throughout the day, coupled with copious amounts of laughter that will encourage you to try something new or revisit material with greater understanding and potential for success. There will be a 45-60min lunch break please bring a packed lunch. For info, chocolate buttons have become the Godstone standard sugar & energy supplement. Cancellations 7 or more days prior to the start of the event will be issued a refund less an administrative fee of £10. No refunds, no transfers, and no credits for cancellations within 7 days of workshop start date. No refunds or credits for failure to attend or failure to complete the workshop.